Encountering any new Faust record is a bit like wandering around a run-down and seemingly dilapidated farmyard. There is the detritus of rusted-over machinery and scrapped industrial implements scattered at random over once fresh ground long since turned to mud and edgeland sludge. It can seem fairly uninviting at first but keep looking and you may find tools and methods of working which reflect on the landowners' pasts and possible futures. Following a spell in which there were two different versions of the group, Faust now exist solely as the recording and touring unit of Jean-Herve Peron and Werner 'Zappi' Diermaier. Sometimes this duo work alone and apart from the rest of the music world and sometimes in collaboration with it, and they always produce material which remains true to their 1971 founding ethos of commune-dwelling anarcho-hippies. In terms of the great 1970s German groups banded together under the horribly misjudged moniker of 'Krautrock', it is perhaps Faust who have remained steadfastly welded to experimental and avant-garde principles. Through no fault of their own, Neu! have long since had their sleek motorik design appropriated by every piss-poor indie band looking to 'expand' their sound while the mighty likes of Can and Cluster, their influence spread wide across numerous musical spectrums, have managed to remain aloof in their own rarefied bubbles. 2014's Just Us found Peron and Zappi working in isolation and in consequence producing a record which they proclaimed as only half-done, the work left hanging to be completed by any producers or listeners who wished to finish the abruptly cut-off sentence that album represented. In doing so, Just Us sounded in itself as though Faust had hermetically sealed themselves in that farmyard and were tinkering with the clapped-out controls in search of, then not quite finding, inspiration and releasing the results anyway. It was a record of blind alleys and empty spaces but somehow beguiling enough in its desire to let us hear Faust's processes stripped bare. 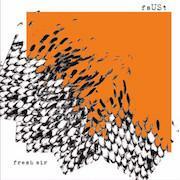 Now, on Fresh Air, Faust have stepped away from self-imposed confines to re-engage with the world. Recorded at various locations on a US tour, in a live and studio context with a roster of special guests including Barbara Manning, Ulrich Krieger and Ysanne Spevack, this is perhaps Faust's most solid and coherent body of work since their 1990s resurrection. It roars with sadness and anger at a world's squandered opportunities. The title track builds steadily and relentlessly as lamenting strings, tinkling percussion and blankly recited poetry woozily smear and dissolve into an almighty blast of infernal rage, Peron furiously yelling “We need, we need, we NEED FRESH AIR!” A simple yet apposite evocation of the desperate need to retaliate further against stifling suffocation and the seemingly permanent alert-state of walls closing in. There is light and revelling here also, in the sweet-aired aviary of 'Birds of Texas', the angular rock and roll grind of 'Le Poulie' and 'Chlorophyl' and 'Lights Flickr''s remorseless squall of forward momentum which could soundtrack Bill Pullman driving furiously down a lost highway in the dead of night in search of dissolution and transformation. Finally, 'Fish' yearns beautifully and elegiacally for lost youth, a disappearing blue world and the sea which could wash away our troubles and return some form of balance to our confused psyches. But perhaps even the sea is leaving us to complete our blind self immolation? In these sad, pensive and strangely serene 11 minutes Faust manage to construct a shifting soundscape for humanity and Earth in 2017. They have left behind the bare, boarded-up strictures of Just Us, gone outside and started moving as fast as they can. It's the only way to live now.